On the lines of Fingerhut catalogs that are still being sent to millions of houses today, well known as a recognizable source for borderline useful tchotchkes for the home, the Damark catalog generally provided similar product offerings in the form of electronic devices. One thing about these catalogs is that they are a snapshot in time when it comes to consumer electronics. Perusing through it, there appears to be no class of electronic item that would be excluded. I suppose that if they got a good deal on any closeout electronics (or even beadspreads), it’ll end up in the catalog. Some of the items look familiar to me, but have a different manufacturer name (or it is listed as “Famous Maker”). On the front cover of the September 1990 catalog, there is a Cordata brand 386 IBM-compatible computer that looks very similar to an Amstrad computer that we had on display in the Electronics Boutique store I worked at around the same time. The same goes for the cell phone also on the front cover. I had one that looked the same. I forget the brand, but I bought mine at a Silo store. You’ll also find average quality brand names such as Goldstar, Emerson, Sharp, and Craig. In fact, I don’t ever remember Emerson creating computer modems, but right there on page 14 of the catalog, is an Emerson 2400 Baud external modem for the “Damark Price” of $99.99 (data cable not included, I’m sure). It reminds me of the old Supra brand modems. Perhaps they were, but rebranded by Emerson. Since this is a 1990 catalog, there won’t be a shortage of VCRs purporting to have the best quality video output your money can buy. I noticed one item on page 36 that I bought a long time ago. It is called the “Sound Sender.” It takes the output of your portable cassette or CD player and rebroadcasts the audio to your FM radio in the car. Mine looks just like the one in the catalog, but I believe I got mine at K-Mart and not Damark. 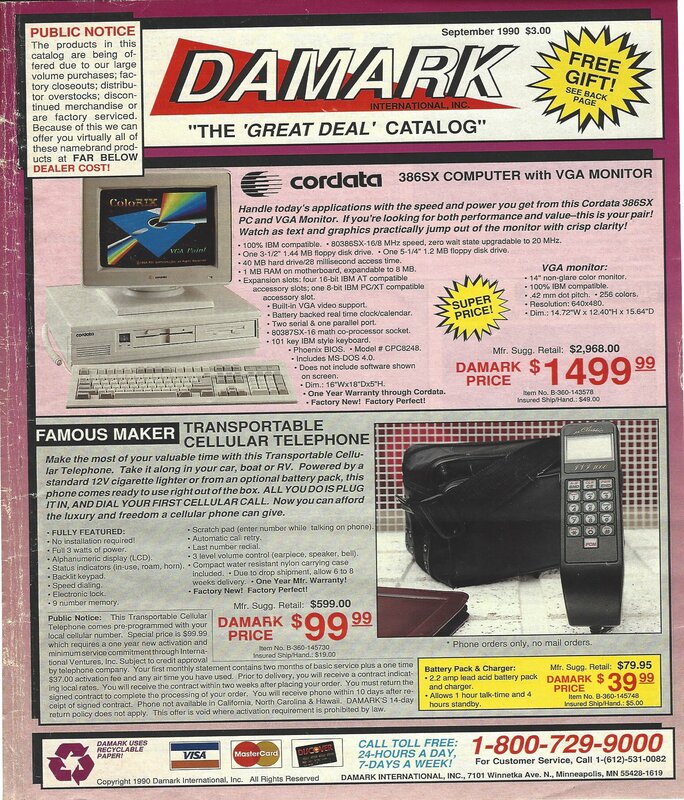 Back then, I did not have access to a credit card, and I didn’t want to risk sending a check, so I never bought anything from the Damark catalog. I just enjoyed looking at the product line. There are far too many items to talk about in this catalog, so I encourage you to look at the catalog yourself. Maybe you will recognize something you once had, even if it from a different manufacturer. If you find something like that, let others know in the comment section below this article. 18 Comments to "Damark – The “Great Deal” Catalog"
together with its recharge cradle. I don’t sell the items in the posted catalog. It’s only on this website for nostalgic reasons. That was a nice walk down Damark lane. I remember how excited I would be to get the new Damark catalog in the 80s and 90s! I got my first computer, a Packard Bell with 640K of RAM, DOS, and a 10MB hard drive! One of the earlier IBM clones, I’m guessing. That 10MB hard drive was probably an MFM style drive. They don’t seem very high in capacity these days, but I bet it took a little while to fill it up. So you dont have a catalog and you dont sell anything anymore? I have the best laminator I purchased from you many many years ago…so what is your website where I can by things? I am not affiliated with Damark. I just had a copy of their catalog in some boxes I’ve stored away for many years. I saw no other copies of the catalog online, so I decided to scan mine and share it publicly for archival purposes. OMG. Did you read the article? It wasn’t hard to figure out he’s not Damarck and not selling anything!!!!! I loved the old Damark catalogs. I just peeled off an old shipping label from my circa 1997 Flowbee. An era gone bye. Thanks for the memories! I bought so much stuff from them when I started my business. Great Company actually..
A blast from the past! Thanks for posting the great find. I remember DAMARK. My dad and I each bought Packard Bell 286 Computers- $1500- a deal back then. We were excited because they included 14 inch monitors. Mine had a 40MB hard drive while my dad only got 30MB for the same price. Now, I send bigger files over the internet. I was barely a teenager during the early 90s, and remember the Damark and Fingerhut catalogs. We got our first computer from there (Packard Bell). I remember how excited it was to finally be able to play PC games. My dad used to order stuff from there every now and then. He once bought me a police scanner radio for my birthday from there (I wanted one). Although it’s long gone now, I still keep one on hand because it’s extremely useful to have during emergencies/natural disasters. Still have and use a Cypress Garden water ski I purchased thirty years ago from Damark. It was a great company. Nothing better than the 5 inch TV that had a VHS vcr next to it. Hung it in the mini van for the kids. Yes our 1992 Toshiba CRT TV and many other Damark purchases are still running in our house today. They were Circuit Cities mail order price beaters. Old model railroad VHS tapes need a vintage HW. I bought many things from them including the electric remotes for our tv’s which were installed over the channel knob! By all means… share away! I can’t tell you how many “Great Deal” floppies I purchased from Damark. I still have some floating around. Thanks for the look back.